A (burger) lady in the kitchen. 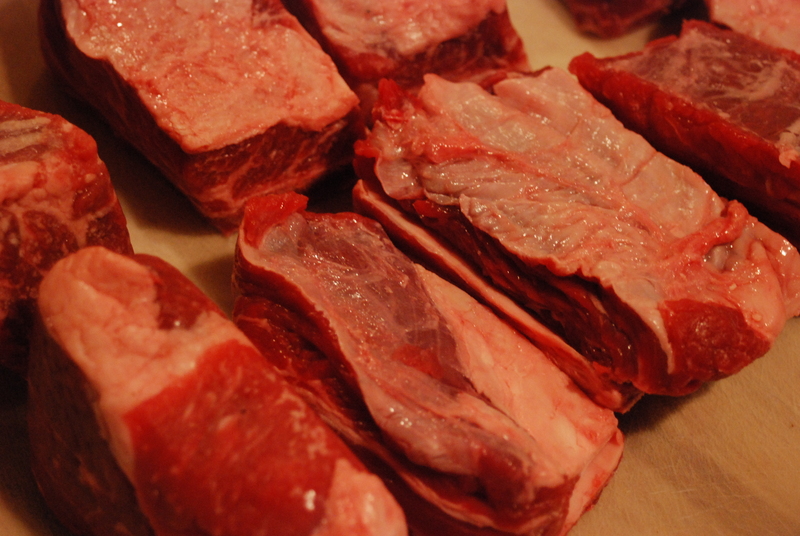 Anyway, BG stumbled upon this post which put her in the mood for short ribs. After she sent me the link, I was in the mood for them, too. However, being a Thursday during Lent, I knew that I was going to have to wait until Saturday to dive into a plate of beefy goodness. Uncle G invited us over to hang out for the evening with my six-month old cousin, so we figured that it would be a perfect opportunity for burgergal to show off some of her skills in the kitchen. And short ribs are tender enough for a six-month old, right? Burgergal wanted to take care of the meal herself, so I was playing the role of assistant. It’s tough for me to not jump into food preparation, but I had to force myself to be a (somewhat) passive bystander. BG picked up a couple of pounds of short ribs, and I seasoned them up while she got her mise en place going. And a carrot (forgot to take a picture). That was pretty much it. The rest was all about the meat and the wine. 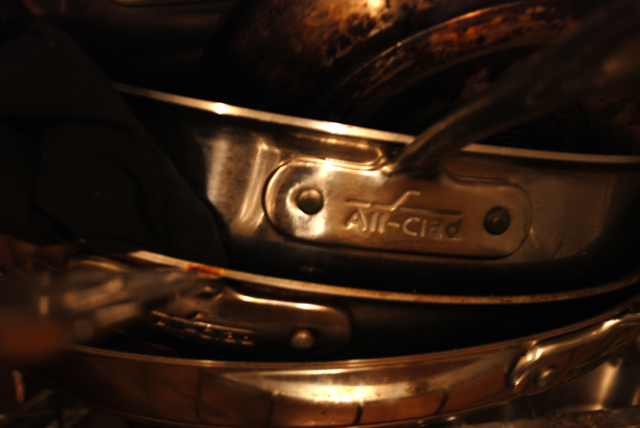 A very simple braising recipe by braising’s standards. First, she rendered the fat from some pancetta and removed it from the dutch oven. A little glug of olive oil added to the fat from the pancetta and it was time to brown the meat. Easy stuff. Burgergal handled this like a champ, with me only providing a watchful eye as she stole the show. After removing the meat, she added the onions, shallots, and carrot and softened them up. A nice amount of Carmenere and an equal amount of beef stock later, we were off to the races! 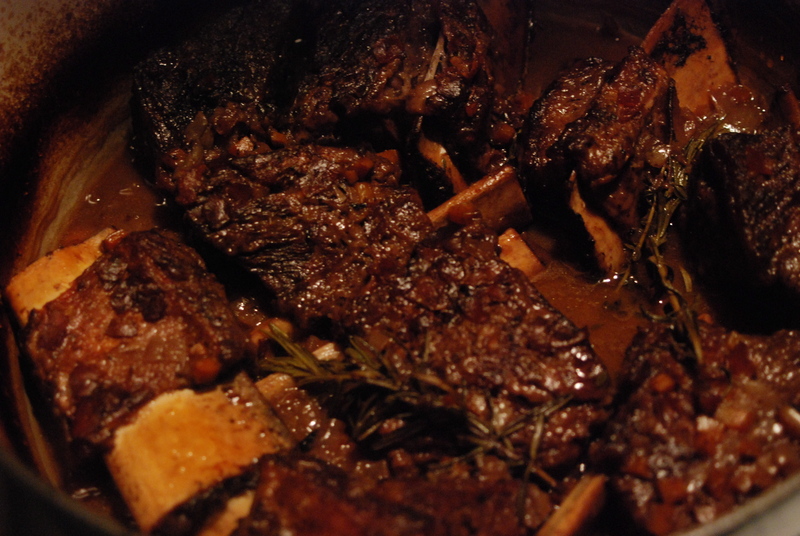 She added the short ribs back in and popped the whole thing into the oven for about three hours. They emerged from the oven looking deep brown and succulent, with the meat falling off of the bone (as it should have). Being Friday, I was gonna have to wait until Saturday to dig in. I did, however, get to sing the McDonald’s “Give me back that filet-o-fish” song a few times. For serving, we whipped up some polenta with parmesan, to use as the base for the braised goodness. The recipe was very low fat, so it did not get as creamy as polenta is in restaurants, but the flavor was great and it made for a very photogenic presentation. Burgergal’s short ribs: a million out of 7 cows! Tags: carmenere, cooking, pioneer woman, short ribs. Bobby Van's Revisited and a Weekend out in the Hampts. A few weekends ago, BG and I headed out to Bridgehampton for a little getaway outside of the city. With the business school applications behind me, it was time to start living again on the weekends. I was looking forward mostly to getting in some solid wine drinking and eating. The weather forecast called for some snow flurries, but inclement weather wasn’t going to put a damper on my planned consumption. We were taking off on Friday night straight from work, meaning that we wouldn’t get into town until about 9pm or so. For me, this meant only one thing– bar food at Bobby Van’s. Although my last trip to BV’s hadn’t been exactly inspiring, I had high hopes for the sliders, and I knew that after a 3-hour train ride, I would need some nourishment. As expected, we got to Bridgehampton at about 9. After picking up the car, we headed over to Bobby Van’s. Even though it was the off-season, the place was bumpin’ with locals looking to cut the lack of excitement with a few drinks and some grub. After a short wait, we nestled up to the bar and ordered a couple of Brooklyn Winters. (Side note, I’ve really be hooked on the Brooklyn Brewery Winter Ale this season. It’s got a great depth and body to it without being overly heavy. A great seasonal brew from the local boys.) I didn’t need to see the menu– an order of mini Kobe burgers and a order of the lamb sliders with mint chimichurri. It was burger time. After a brief wait, the six little gems arrived. They all arrived on nicely buttered brioche buns. You always know how unhealthy a bun is based on its reflective surface. I could practically see myself in these things. Without going into too much detail, I’ve gotta say that the bar burgers are much better than their full-sized sibling. They were great. I found the Kobe ones better than the lamb, but this was probably because the mint chimichurri was fairly lacking in substance, and the lamb patties were a bit too mild for my taste– they lacked that gaminess that I look for in a good lamb burger. Either way, the meal was truly satisfying, and was a great way to kickoff the weekend. Later that evening, the remaining guests arrived, and we proceeded to put back a few bottles of wine with ease. A good night’s sleep ensued. The next day, we headed out to the bowling alley, where my rusty skills impressed no one. Then the ladies did a little shopping while the men put back a few brews at Rowdy Hall in East Hampton. But enough of this “outdoor” activity, let’s get back to some eating. 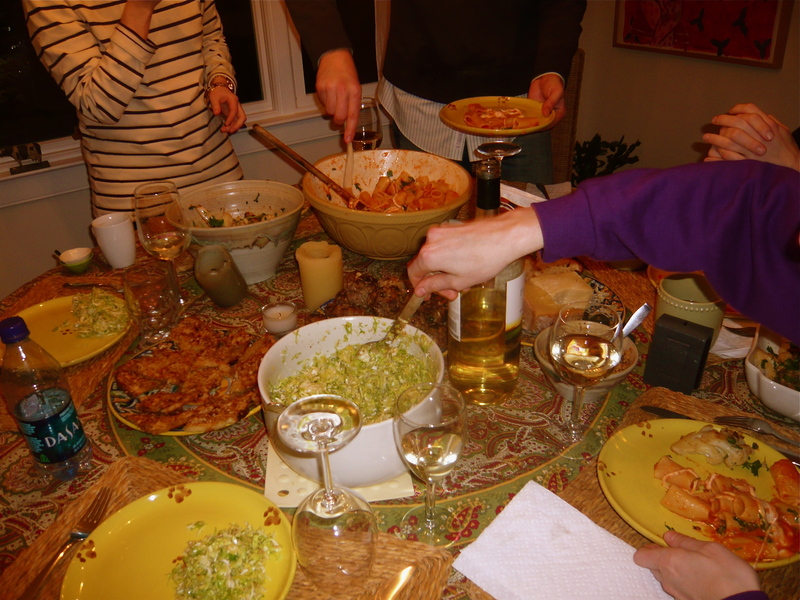 The culmination was supposed to be a big Saturday night dinner. Although we were only six people, I envisioned a giant roast pig filled with sausages and other meat products, as featured in Fellini’s Satyricon. The copious amounts of food that we prepared were actually not too far off. Owen made a toasted walnut and sun-dried tomato pesto, which was great– a combination of earthy walnuts combined with a little salty tang from the tomatoes and a touch of balsamic vinegar. 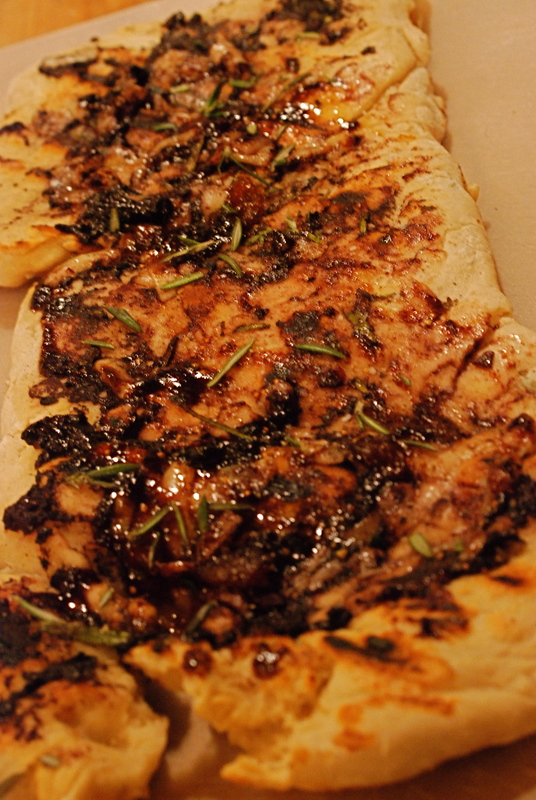 He also made some cheesy onion bread, baked in the oven until melted and delicious– as he described, it was like “onion soup on toast.” BG thought it was a bit too salty from the cheese, but I could have eaten that stuff all night without any complaints. Perhaps I would have been bloated for a week, but well worth the pain. 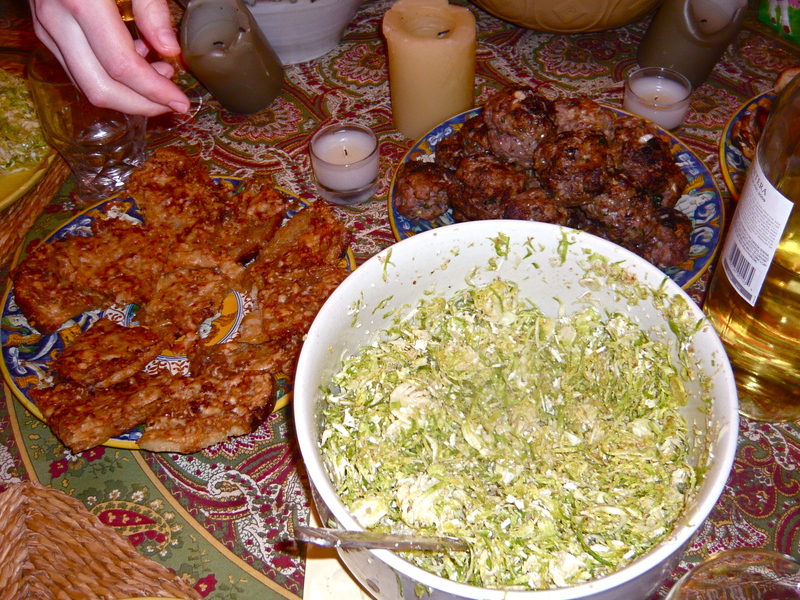 The bread is on the left of the bowl of green, which in this photo looks like a giant bowl of guacamole, but was in fact a shredded brussels sprout salad, keeping in line with the whole bloating theme. 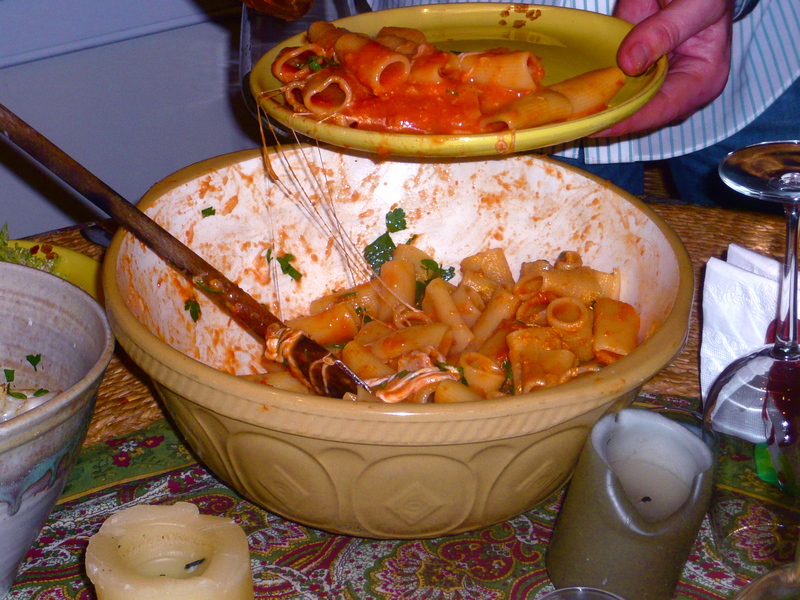 The main event was a big bowl of pasta that Owen also rocked, with a simple red tomato sauce, very similar to the Scarpetta sauce that is taking over the Upper West Side like a red-tomato plague. So what did I do in this whole mess? I know, it’s not like me to just sit back and enjoy without getting my hands in on the action. I had only one contribution, but one that I took very seriously. I am by no means a meatball master. I have dabbled in the spherical balls of goodness, but I am hardly an expert of the subject. I usually like to cook them in red sauce, but because we had a vegetarian in the house, these guys had to be made separately from any sauce. No sauce? No worries. Let’s just crank up the fat content. I went with an 85% lean ground beef (I wanted 80%, but BG persuaded me to be “healthy”), and matched that with an equal amount of ground pork. The secret ingredient was a good glob of bacon fat leftover from the morning’s bacon, egg, and cheese sandwiches. Aside from that, the mixture was pretty standard: a good amount of parmesan cheese, parsley, some fresh baguette soaked in milk, and a good amount of salt and pepper. 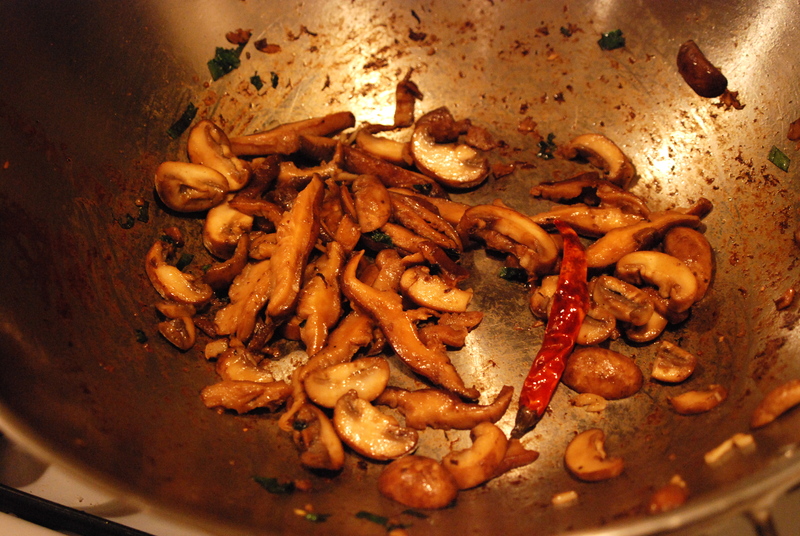 Not wanting to take the chance of eating anything dry, I opted for a pan-frying and finishing the lot in the oven. About 45 minutes later, we had delicious, golden-brown balls of meat. None of us would have an iron deficiency after this meal, that was for sure. They were tender from the milk-soaked bread, with a great earthiness from the parmesan cheese and a little freshness from the parsley. Not too bad, I must say. 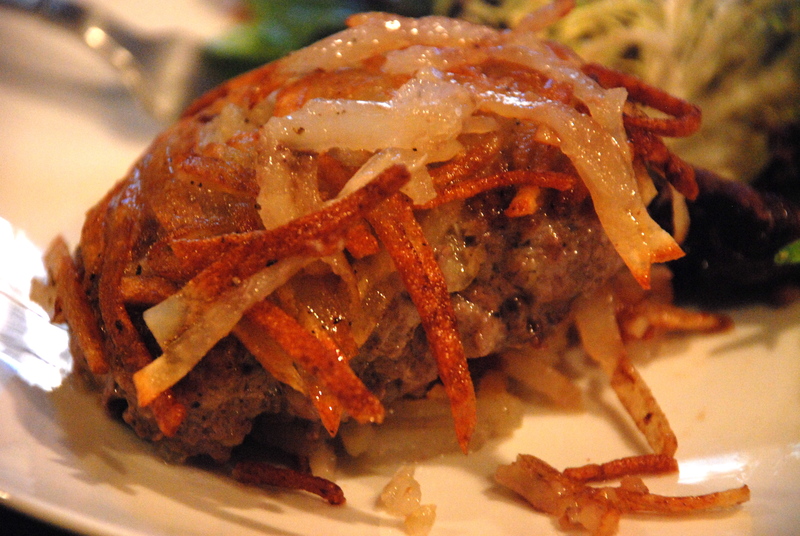 A little close-up of the onion bread, salad, and meatballs is featured below. All in all, a great weekend, with a return to NYC just in time to see the Saints win the Super Bowl. Even better. Tags: bobby van's, burger spots, cooking, hamptons, meatballs. 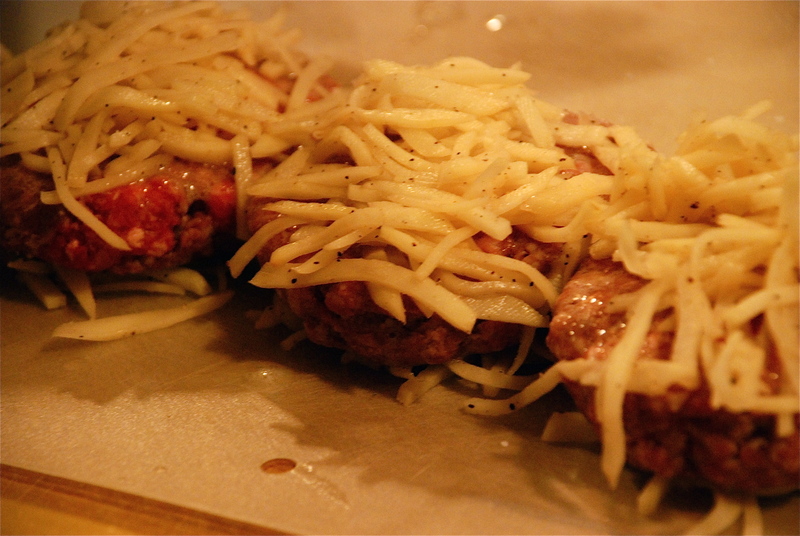 Burger Bar Cookbook: The Burger Nest. So, I’m a pretty awesome burgerboyfriend. So, come Christmastime, I got burgergal Hubert Keller’s cookbook, among other awesome super-thoughtful gifts. The book has a lot of recipes that I will probably never make, but it’s got some interesting ones, too. And it has pretty pictures. One of the more intriguing recipes is called “burger and fries.” It’s a pretty innocent title for what is actually nothing like burger and fries. Burger IN fries, maybe, but nothing like burger and fries. It’s more like a nest of fries, with a burger inside of it. It looks very difficult to make Since burgergal and I are on a healthy kick (or something… I mean, we are getting Momofuku bo ssam on Saturday, so…), we decided to try this one, since it seems to be less terrible for you than a burger on a squishy potato bun. Never mind the fact that it is pan-fried. That is but a trivial detail. With a Monday off, lunch time seemed to be the best time to finally make it happen. I defrosted the pound of ground Sun Fed beef that I had picked up at the market back when I used to brave it on Wednesday afternoons at the office. For having been frozen, the meat was surprisingly good looking. It was in one of those hermetically-sealed vacuum bags, so that seemed to keep everything in good shape. After making the patties and letting them chill for a bit, it was time to get it going. I first took care of the julienning the potato. 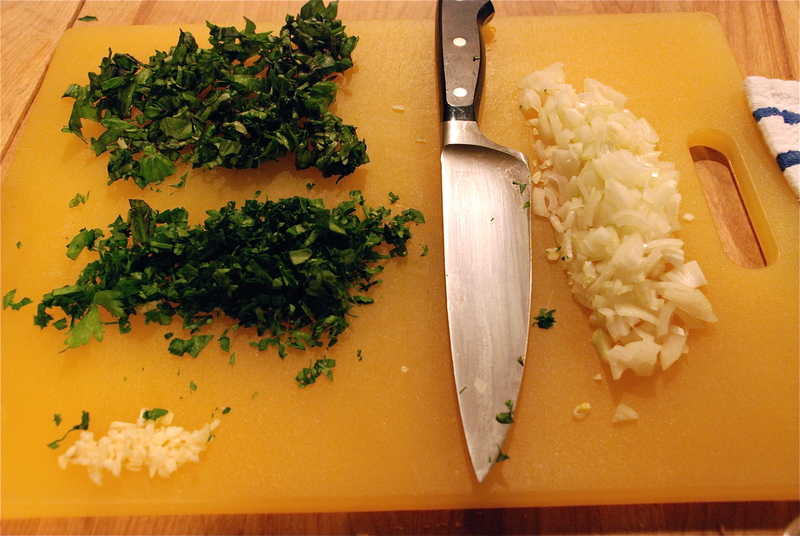 Since our mandoline doesn’t have a fancy julienne attachment, I had to do a little knife work by hand, but that was ok with me. I seasoned up the potatoes in a bowl, and let some of the moisture seep out. Right before making the nest, I gave the potatoes a quick squeeze in a kitchen towel and got to work. 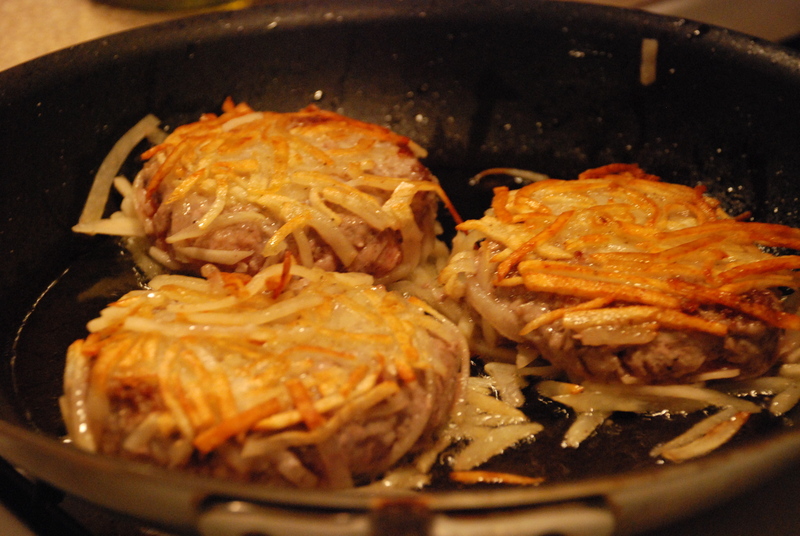 First, I brushed the hamburger patties on one side with a beaten egg white, and laid the patties on heaps of the potato strips, hoping that the potatoes would stick. 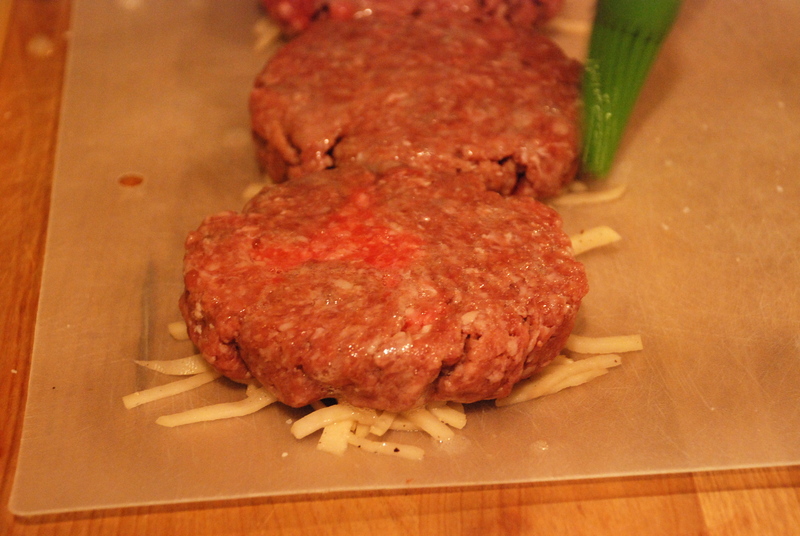 Then, I delicately placed another heap of potatoes on top of each patty, and again, hoped they would stick. Right off the bat, I found that my julienned potatoes were nothing like Hubert’s. His were so much finer, so much more… French. But no matter, all of this was going to get fried in olive oil, so who cared what it looked like? Then, with my clumsy American hands and fatly julienned potatoes, I went to work “pressing firmly yet gently” to get the cocoon of potatoes just right. After a few minutes of sheer frustration, I just decided to go with what I had. I was getting hungry, anyway. Now, the fun part. It was time to fry up the burgers. We pre-heated the oven to 450 and got a pan going with a good amount of olive oil. As I stared at these potato-strip-covered patties, I wondered how I was going to transfer these things from my jelly board into the oil. The whipped egg-white “glue” was not exactly the most reassuring of bonding agents. I was worried. I carefully placed the potato burgers into the pan. As you can see, I had some collateral damage going, and lost most of wrapping on the sides. I took a mental note for next time (rather, burgergal watched and told me): get more potatoes going, so that they are veritably smothered in potato… enough has got to stick. I also thought that using the egg white as part of a dredging process could work, too. I’ll have to let everyone know how that goes. After a few minutes on one side, it was time to flip. Again, this wasn’t so easy since the “fries” weren’t exactly stuck to the patties like a starchy-tuber-wallpaper. I got my widest spatulas and did my best. I lost some potatoes again, but it turned out better than expected. And, special bonus: the fries had actually crisped up! 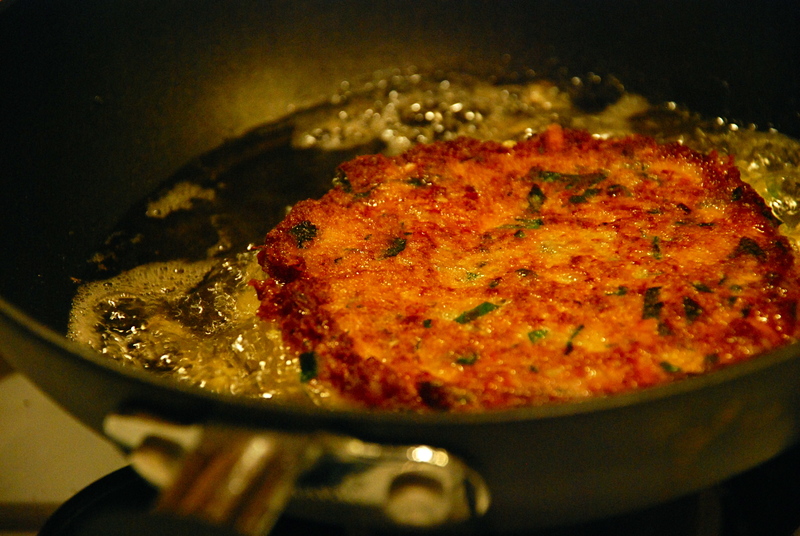 They are kinda like meat latkes, aren’t they? Despite all of my concerns, the smell that was filling the apartment was delightful. I wish I could send it along to you all, because it smelled like a mix of burgers on a griddle, fries in a frier, and the smell of a garlicky vinaigrette that burgergal was making for the healthy component of the dish, the salad on the side. 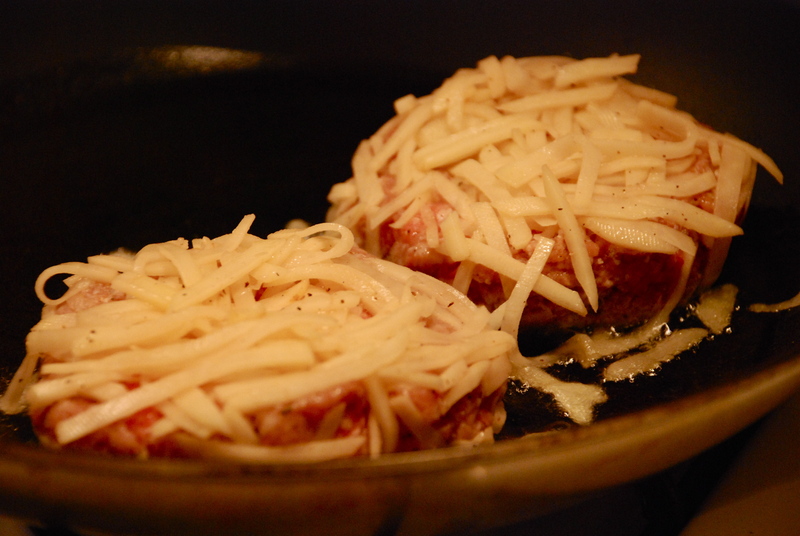 From the stovetop, the burgers went into the oven to finish cooking through. About ten minutes later, we had some perfect medium-cooked hamburgers. I let them rest on a rack for a few minutes, then plated them up. The burger-fry cocoon was delicious, I must say. It had all of the satisfying traits of a hamburger and fries, just without the squishy bun, which I did not miss (too much). Through some of the errors of my ways, I think that I will be able to hit this one out of the park next time. 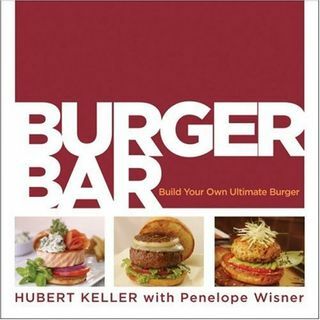 Tags: burger bar, burgersforcooking, cooking, hubert keller, sunfed beef. I do clip recipes, although I rarely use them. I’m more of an experimenter. I throw some stuff together and cross my fingers. But the other night, it was time to make something a bit more planned out. I had clipped a recipe from an old Gourmet magazine for eggplant towers, perched atop a mixture of bread and egg, fried to golden deliciousness. It was pretty much an eggplant parmesan, but a little bit more trendy looking, with some extra greens and a fried platform. The recipe started out by making a simple tomato sauce. Having just made the Scarpetta sauce on Friday, I was totally prepared to get into another tomato sauce. 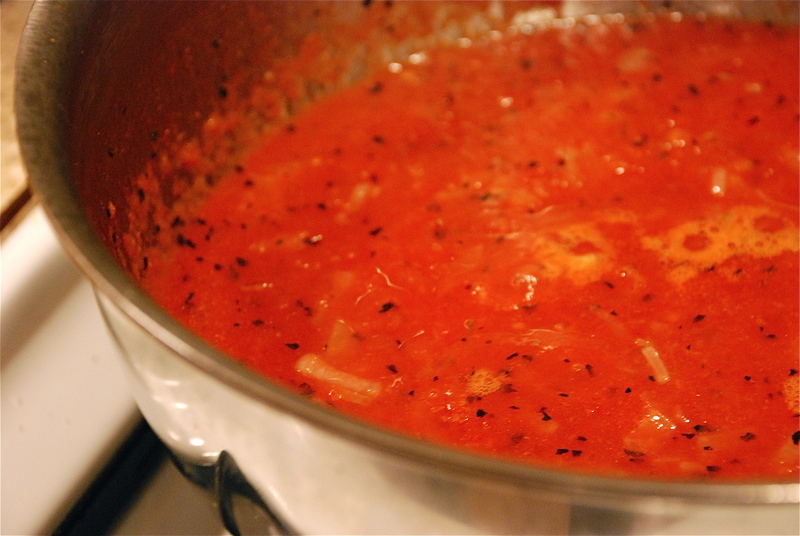 I sweated some garlic and onion, added a puréed can of tomatoes, added some chopped basil, and let that simmer down. Cake walk. 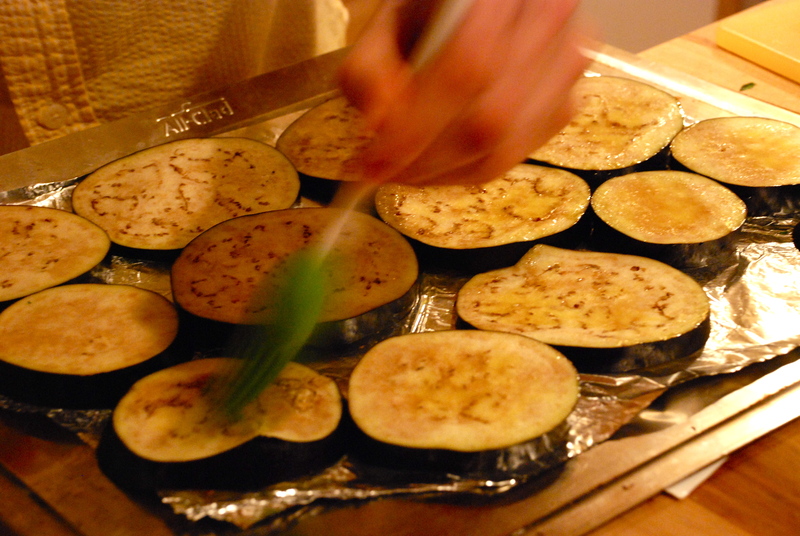 Next up was roasting some eggplant slices. Pretty basic stuff, really. Seasoned, brushed with oil, and baked for about a half hour at 450, the building blocks of the tower were another easy step. 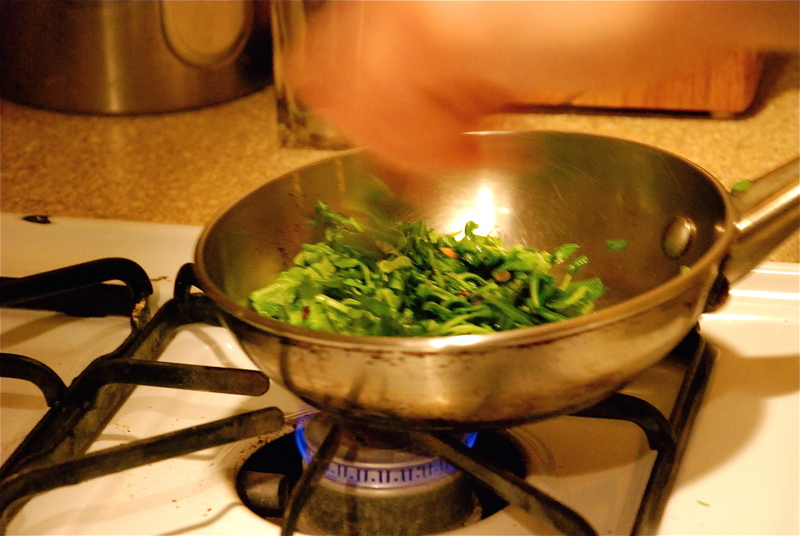 Next up, sauteing some arugula and basil together, representing the only green component in the dish. Again, pretty easy stuff: heat up oil with garlic and crushed red pepper flakes, add basil and arugula until it’s wilted, and bob’s your uncle. Last up, the egg and breadcrumb foundation of the whole tower. 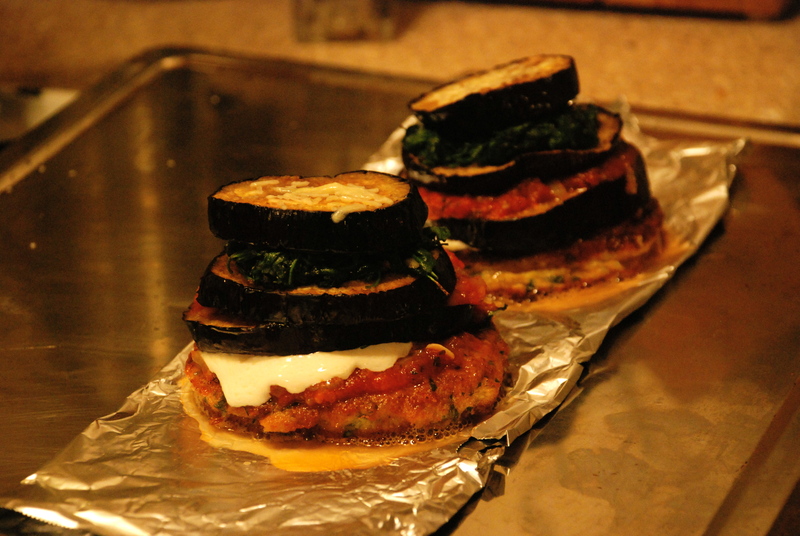 The roasted eggplant tower would rest upon a fried patty of goodness. 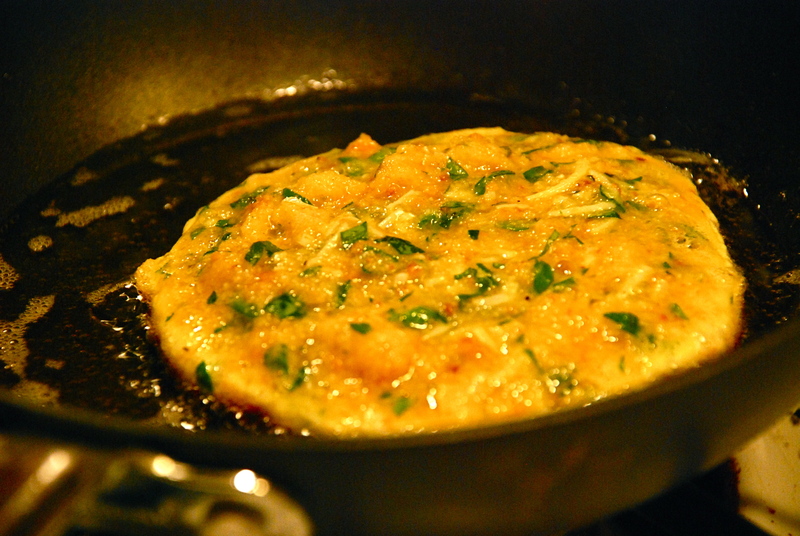 Shaved parmesan, parsley, basil, egg, and breadcrumbs, mixed together and fried up in oil. How could that be bad? The last step was putting it all together. On top of the foundation, a thin layer of tomato sauce was laid down, with a slice of mozzarella cheese on top (see how it’s like the eggplant parmesan? ), then a slice of eggplant, then some more sauce, then another slice of eggplant, then a bit of the wilted greens, then another slice of eggplant, then some sauce, and finally a little sprinkling of parmesan. Think we’re done? No way! 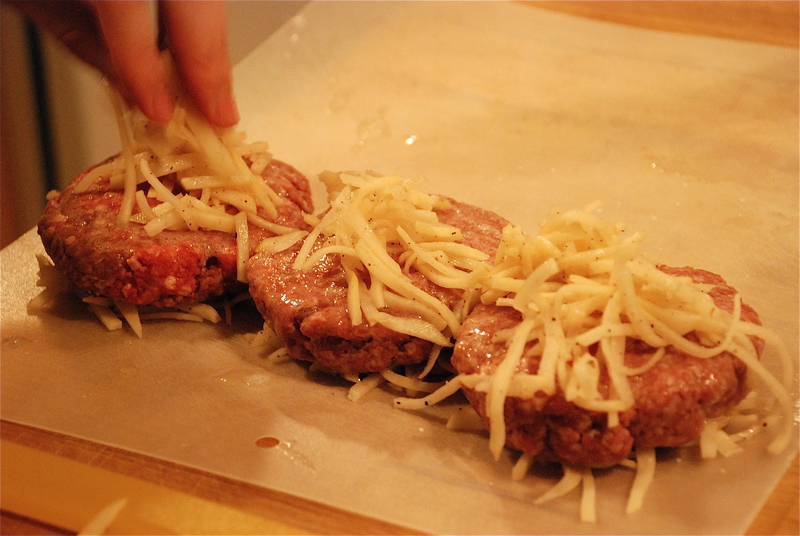 Pop that into the oven. 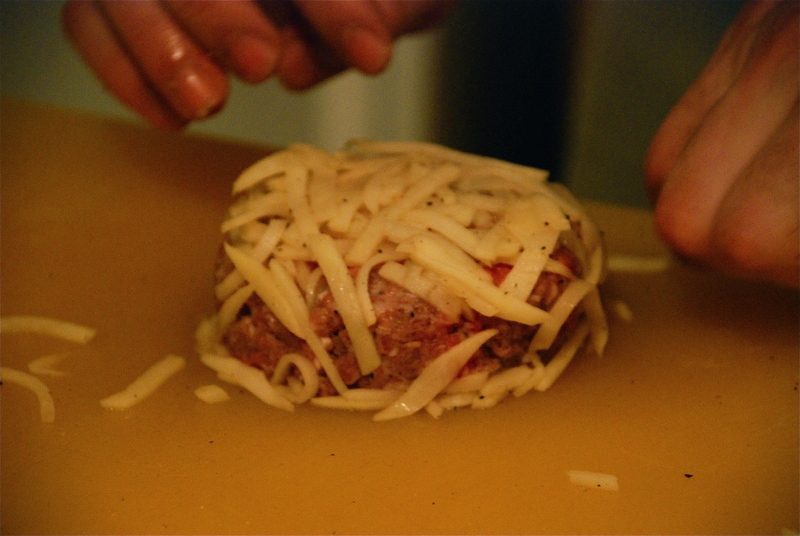 It’s time for the mozzarella to get its melt on. And there it is.